The trial of Rafael Marques de Morais began on 24 March in Luanda, amid heavy security measures. In the opening session the defence learnt for the first time of new charges against the accused, for which no formal notification had been received. The trial was adjourned until 23 April to allow Marques de Morais and his lawyers to be formally notified of the charges and to examine their substance. The case initially involved eight charges of criminal libel, stemming from the charge that Marques de Morais filed in 2011 against nine generals who are the owners of the private security company Teleservice and the diamond mining company Lumanhe, which is part of the mining consortium Sociedade Mineira do Cuango (SMC). 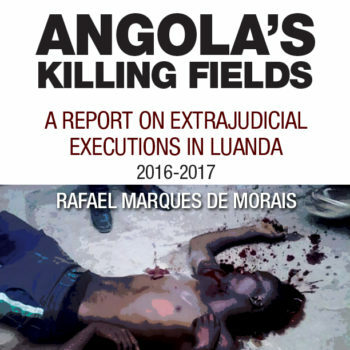 Marques de Morais brought the charge against the generals on the basis of testimonies about torture and killings that were presented in his book Diamantes de Sangue: Tortura e Corrupção em Angola (Blood Diamonds: Torture and Corruption in Angola), published in Portugal earlier in 2011. The prosecution has now added 15 new charges of defamation to the case against Marques de Morais, based on the fact that he published the book. Neither he nor his lawyers, Luís Nascimento and David Mendes, had been aware of these new charges. The charge that Marques de Morais lodged with the Attorney General against the generals mentions “the central role of the consortium that makes up Sociedade Mineira do Cuango (SMC) in everyday acts of torture and, frequently, of homicide, which constitutes the practice of crimes against the uprooted communities in both districts and informal diamond diggers”. Teleservice, as the security provider in the SMC diamond concession zone, was directly responsible for the abuses that were recorded. The Attorney General considered the accusations unfounded, and set the case aside. The generals and their partners in turn lodged a criminal complain against Marques de Morais in Portugal, for defamation. The Portuguese judiciary, in Lisbon dismissed the complaint in February 2013, after considering the evidence presented by both sides. It noted that the investigation had been conducted rigorously and was in the public interest. The generals then took the case to the Angolan courts. They are led by the Minister of State and head of Intelligence Bureau of the President, general Manuel Hélder Vieira Dias Júnior “Kopelipa”, as well as the generals’ fellow civilian business associates in two diamond companies, Sociedade Mineira do Cuango (SMC) and ITM-Mining. The other six generals are Carlos Alberto Hendrick Vaal da Silva (inspector general at the Angolan Armed Forces General Staff), Armando da Cruz Neto (MPLA Member of Parliament), António dos Santos França “Ndalu” (MPLA Member of Parliament) Adriano Makevela Mackenzie, João Baptista de Matos, Luís Pereira Faceira and António Emílio Faceira. Maka Angola has compiled a gallery of photographs of the trial on Tuesday 24 March. The plaintiffs, General Armando da Cruz Neto (first on the left), Adriano Mackenzie, Hendrick Vaal da Silva and others. Judge Adriano Cerveira Baptista ponders the enormous tome in which the charges are laid out. Chiefs MwaCapenda-Camulemba and MwaMalundo, came from Lunda Norte to attend the trial. Defence lawyers David Mendes (left) and Luís Nascimento. The author of Diamantes de Sangue: Tortura e Corrupção em Angola (Blood Diamonds: Torture and Corruption in Angola), in the dock. Some of the generals’ partners and managers, alongside youth activists, before members of the public were expelled and the trial proceeded in camera. Lawyers for the prosecution, led by Fernando Oliveira (right).